This dinner will be hosted by Glenn Horowitz and Tracey Jackson in the Upper East Side on Monday, April 9, 2018 at 7:30 pm. 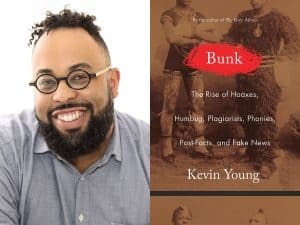 Kevin Young will discuss his body of work and his latest book Bunk: The Rise of Hoaxes, Humbug, Plagiarists, Phonies, Post-Facts, and Fake News, a fascinating, impeccably-researched look at the many ways Americans hoodwink each other, often about race. Kevin Young is an American poet and critic. He is the poetry editor of The New Yorker and the Director of the Schomburg Center for Research in Black Culture in New York.